Under 40 Horsepower Tractors — This segment remained strong in retail sales in September and the year-to-date numbers currently stand 2.8% above our November forecast. 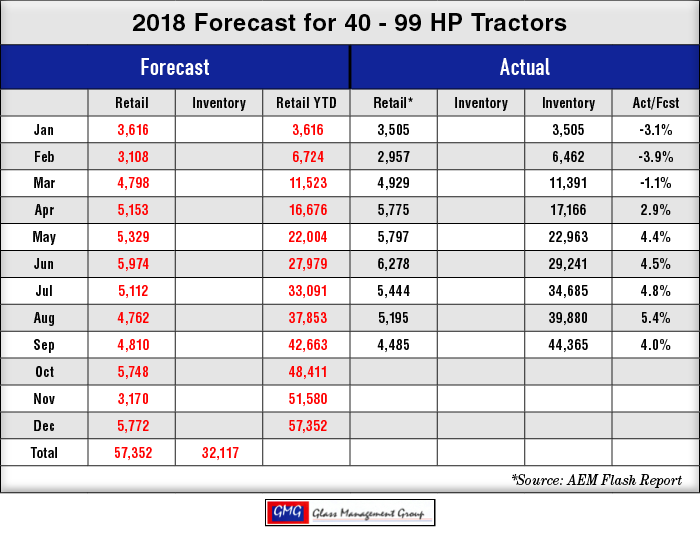 40 to 99 Horsepower Tractors — These very popular sized tractors recorded sales slightly under our monthly forecast but the year-to-date total is 4% above our November forecasted amount. 100 + Horsepower Tractors — This category has gained strength every month of the year and turned positive in July and now stands at 5% above our original forecast. 4 WD Tractors — This category represents the lowest number of units but it also has shown a growing strength each month of the year and currently is 13.4% above our original forecast. 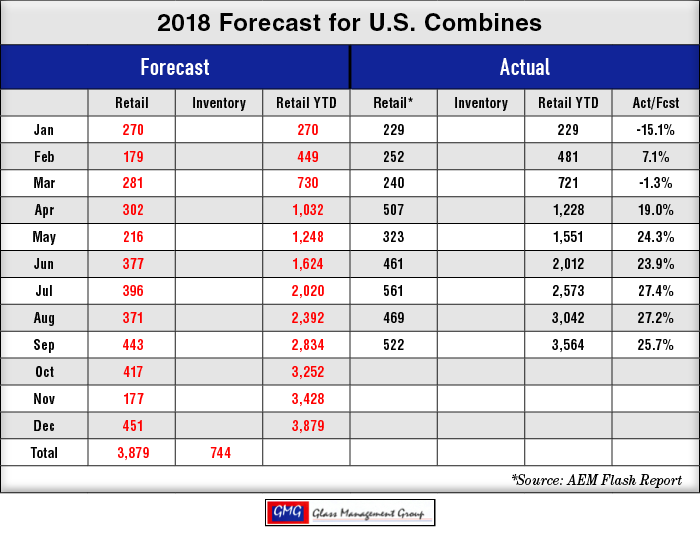 Combines — Combine sales had another good month and is currently 25.7% ahead of our original forecast. At the very last moment Canada’s negotiating team agreed to join the agreement that the U.S. and Mexico had already reached and NAFTA is headed for the history books. The sticking point had long been the massive Canadian tariff on U.S. produced dairy products sold into the country. Apparently that was eliminated from this new agreement and Quebec dairy farmers are up in arms. India has now ratcheted up their plans to enter into an agricultural agreement with the U.S. and those meetings are underway in late September. The Indian market is a large one but they are expecting to find a new market for their beef products within the U.S. borders. The 900-pound gorilla in the room remains China. As the Trump administration tightens the economic restrictions on China there appeared to be some movement to resolve the trade differences. China’s economy is less capable of enduring a protracted economic onslaught than is the U.S. economy and the strain might begin to show in their movement toward a negotiated settlement. All of these agreements must now be ratified by the U.S. House of Representatives and the legislative bodies of both Mexico and Canada and that could be another contentious fight in the future. There are some immediate gains for U.S. farmers and ranchers in these agreements but the real improvement may not be seen until well into 2019. U.S. produced grains are finding new markets around the world but at prices well below those paid by China in the recent past. The continuing political and economic troubles facing Argentina now and in the immediate future will have a negative effect upon their ability to export agricultural products. Brazil is facing similar problems, albeit much less significant than Argentina’s, and that could impact their future ability to market grain internationally. Grain wholesalers in Brazil are emptying their bins as rapidly as possible to take full advantage of the Chinese market. Brazilian soybean producers are planning an increase in acres planted next year in order to supply the expected demand from China. Meanwhile, China is studying ways to reduce their total requirements for soybeans in the livestock feed rations by reducing soybean content from 20% to 12%. How Will This Effect 2018 Agricultural Equipment Sales? The driving force in the purchase of new farm equipment is found in the Net Farm Income available to U.S. farmers. That has been falling for several years now and the influx of the cash from the USDA’s tariff relief program could bring it back to the 2017 levels. Even that would not be enough to generate a major increase in equipment sales. Available credit for farmers and ranchers is becoming somewhat of a problem with more banks tightening their credit requirements and, in some instances, increasing their declination rates for loan applications. Our forecasting models continue to maintain that 2019 will see a slight improvement over the 2018 sales but recent weakness in some markets may limit that growth. 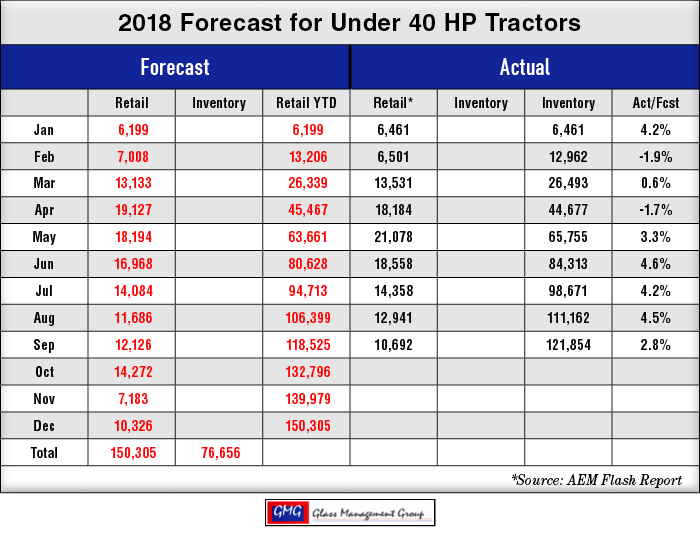 The real bright spot is the Under 40 HP Tractor category and it has been booming and will continue its upward spiral in 2019. This segment is propelled by the U.S. general economy and that shows little signs of slowing down anytime in the near future. Crops for the 2018/2019 marketing year appear to be very good and that coupled with lower export demand has put pressure on commodity prices in the U.S. Since commodity prices are major contributors to farms Net Farm Income, these lower prices are putting pressure on future equipment sales. Corn — The December 2018 contract closed the month at $3.56 per bushel while the March 2019 contract closed at $3.68 per bushel. The May 2019 contract closed the month at $3.75 per bushel. All contracts were up slightly when compared to the August closing prices. Soybeans — The November 2018 contract closed the month at $8.45 per bushel while the January 2019 contract closed at 8.59. The March 2019 contract closed the month at $8.72 per bushel. All of these prices showed approximately $.13 gain over the August closing prices. Larger farmers, those who have the capacity to produce net income above their household income requirements, have cash available to purchase new tractors and combines and that is evident in the strong showing of the higher horsepower tractors and combines this year. As we approach what is considered to be a “more normal” year in 2019, this buying power may be moving into the smaller producers’ bank accounts and that will help fuel the growth expected next year. 2019 will be better than 2018 and we can’t wait for it to get here.